After five months of competitive action and approximately 131 minutes of tense match-ups, it took a decisive penalty from Andrae Thomas to send the 2017/2018 Charley’s JB Rum Western CONFED title to veteran club Wadadah in the championship game played on Sunday, May 13, at Jarrett Park. Wadadah needed the dreaded penalty kick to stun the high-flying and much-fancied Faukland, winning 6-5 from the spot after the teams had played out a bruising 1-1 full and extra time draw. 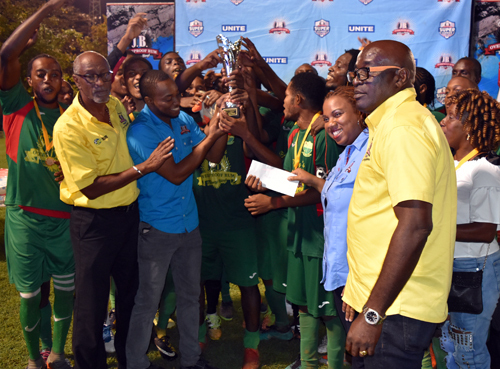 Defender Fabion Gifford, National youth representative Calwayne Allen, Christopher Thompson, Curtis Palmer, Ronaldo Thompson and Thomas with the winning kick, were the scorers for the Wadadah team with star player and captain, Tysahn Hill, who should have won it for them after five kicks missing. Hill slammed his spot kick against the base of the post, giving Faulkland a way back in which they failed to take. Renaldo McLeish, Jelani Nicholson, Husana Johnson, captain of the day Chevoy Watkin and Marvin Sangster found the back of the net for Faulkland, while it was Kyle Anderson and Courtney Allen, with the last kick for his team, who missed. Earlier, Christopher Thompson headed Wadadah into the ascendancy, getting on the end of a timely run down the right flank. However, a moment of weakness in the defensive third handed Faulkland an opportunity which they accepted when substitute Odean Snow swept in from close range, getting on the end of a well-delivered free kick from about 35 yards. Wadadah’s jubilant coach, Daniel Ricketts, was very pleased with the end result, revealing that his plan to nullify their attacks down the flanks worked out well. “They used the width of the field well and that was one of our main plans, to stop their flow down the flanks and it worked well as you saw. We stopped their attacks down the flank through our wingbacks and it paid off for us,” he noted. Ricketts also pointed out that his team was well-prepared to go into penalties. “Since the semi-finals we started practicing penalties. We were prepared, if it came to that”. Earlier in the contest, both started out cagey before Wadadah settled and started to ask questions of the revamped Faulkland backline without their inspirational central man, Okieve Lewis, out through a leg injury. Though Wadadah settled quickest, playing with an attacking purpose and zest down the flanks, Faulkland carved out the first real chance, as Gary Taylor missed a sitter from close range. Obrian Robinson, named the MVP, then responded for the Wadadah team but his effort on the run whistled just over the elbow of the goal. He then set the park alight when he hauled three Faulkland defenders along the touchline, but his ball across goal went tamely into the hands of the Faulkland custodian. The teams went into the break locked at 0-0. During the second half, Deshaun Woolery struck a furious shot on the turn, whistling over the bar after out-muscling two defenders outside the penalty area. Kyle also got a glorious chance for Faulkland, but his goal-bound shot was stopped by a defender as they threatened to take over the encounter. Their pressure would pay off when Snow popped up to find the equalizer, forcing the game into extra time. Both offered chances in the extra time period but the keepers and defenders were equal to the task as they held on for the dreaded penalty kicks. Wadadah walked away with $200,000 and the sponsors’ trophy. The team will turn its attention to the start of the four-team JFF playoffs scheduled to get underway this weekend. Faulkland for their efforts received $120,000, while Reggae Youths and Harmony for their third and fourth place finishes, collected 90 and $60,000 respectively.